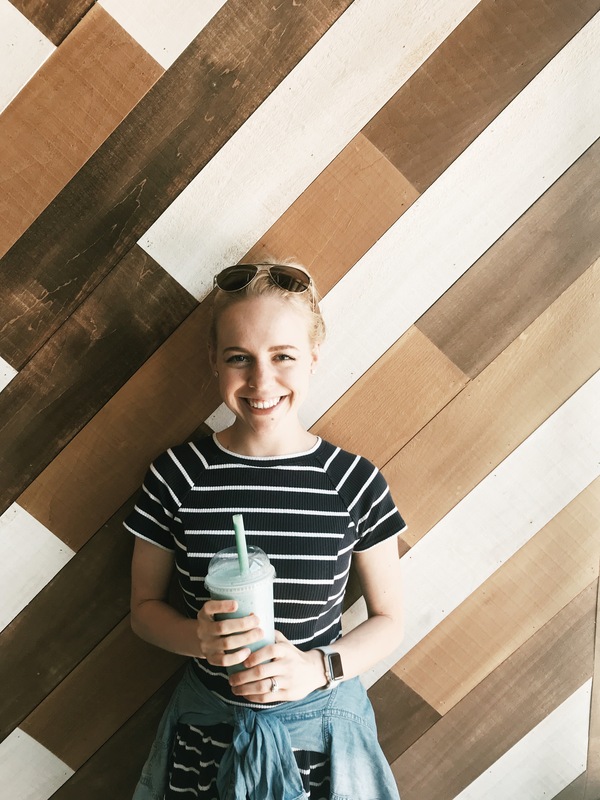 I first tried a buddha bowl while visiting a super cute, “hippie” cafe in Charleston, SC. The simple idea of throwing a bunch of plants into a bowl and topping them with a flavorful sauce intrigued me + I started making my own “buddha bowls”. 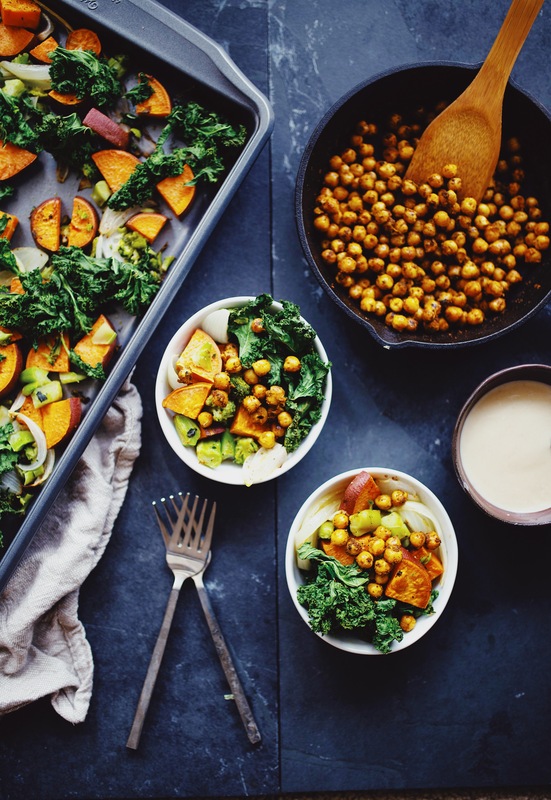 My favorite combo thus far came when mixed roasted sweet potatoes with crispy chickpeas + my classic tahini sauce (that I put on use with everything). 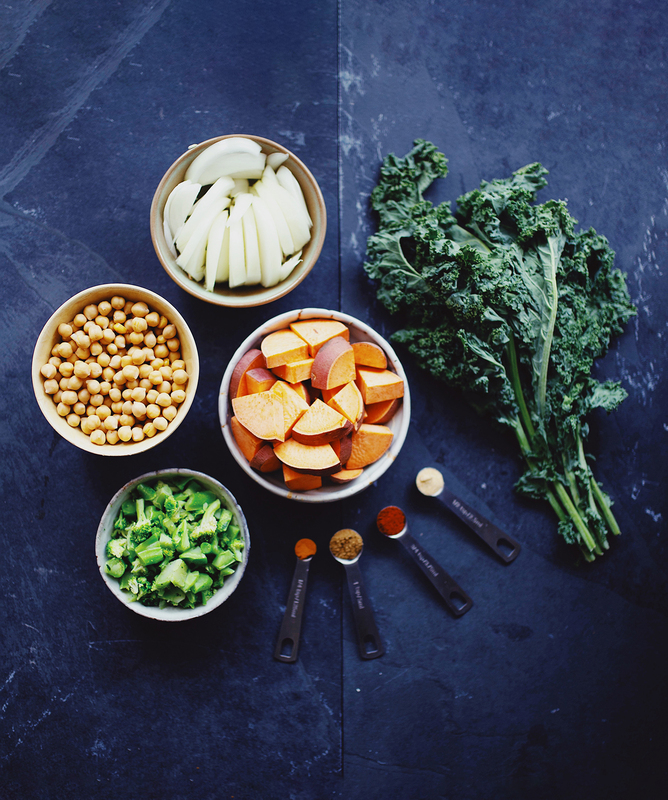 This pairing created the most flavorful bowl, loaded with nutrients, packed with protein, + so easy to make! 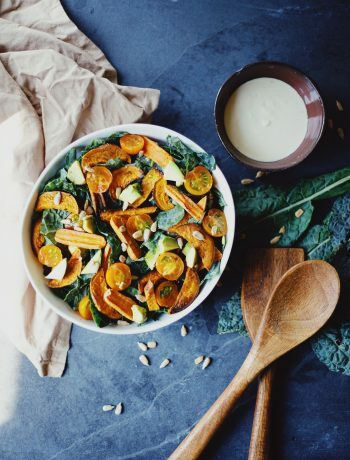 If you enjoy this bowl you might also like my Southwest Sweet Potato Noodles, Harvest Salad with Maple Tahini Dressing, Southwest 3-Bean Chili, or my Late Summer Salad with Tahini Dressing. 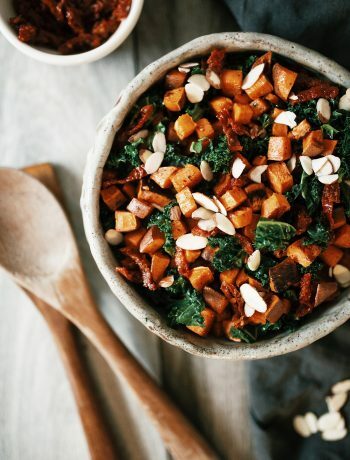 My sweet potato buddha bowl is incredibly easy to make, perfectly seasoned and the most delicious dinner to start the week off with. In just 45 minutes, you can have this recipe on your table! Preheat oven to 400°F. Place sweet potatoes and onions on baking sheet. Toss with 1 Tbsp. of the coconut oil. Bake for 10 minutes, remove baking sheet from oven, toss vegetables, and add the broccoli. Sprinkle with salt and pepper. 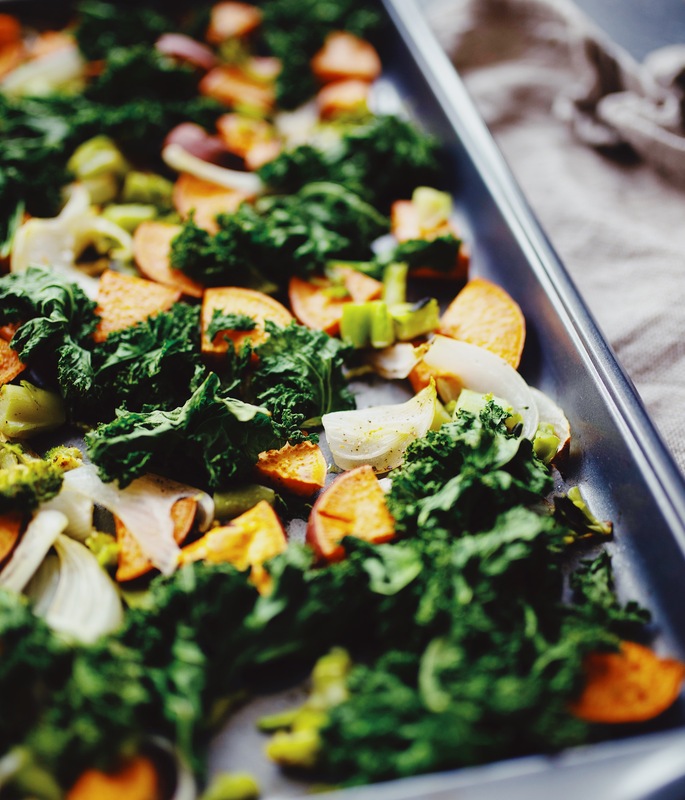 Bake for another 10 minutes, remove from oven, toss vegetables, and add the kale. Bake for another 5 minutes and set aside. 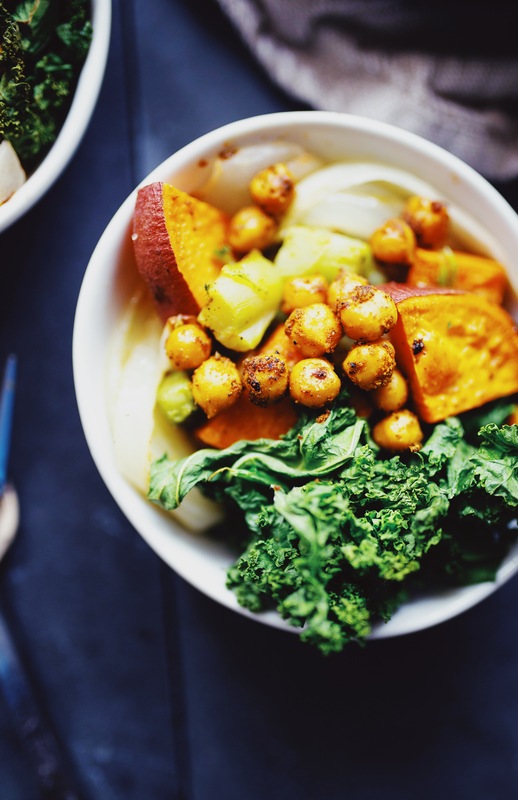 In a small bowl, toss chickpeas with cumin, chili powder, and garlic. Add 1 Tbsp of oil. to pan. Once hot, add the chickpea mixture. 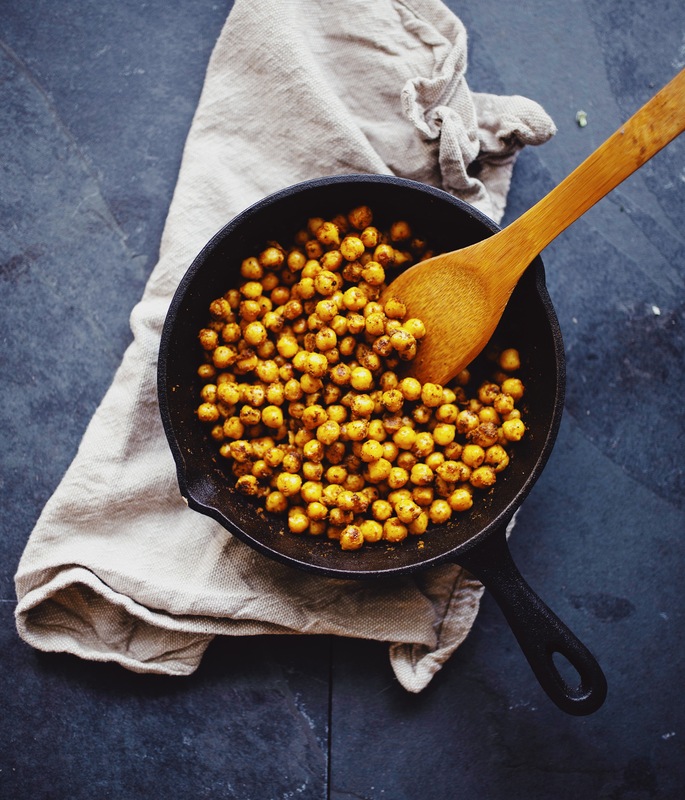 Fry chickpeas until they are dark golden and crispy—about 10 minutes. Set aside. In a small bowl, whisk together tahini, maple syrup, lemon juice, and 1 Tbsp. of the water. If mixture is too thick, add the second Tbsp. to thin. 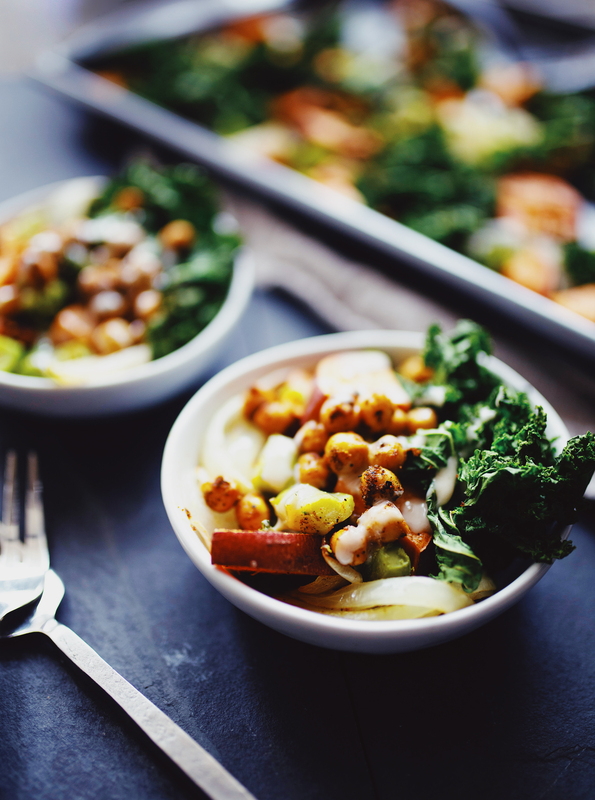 Add the roasted vegetables to individual bowls, top with chickpeas and drizzle with tahini sauce. 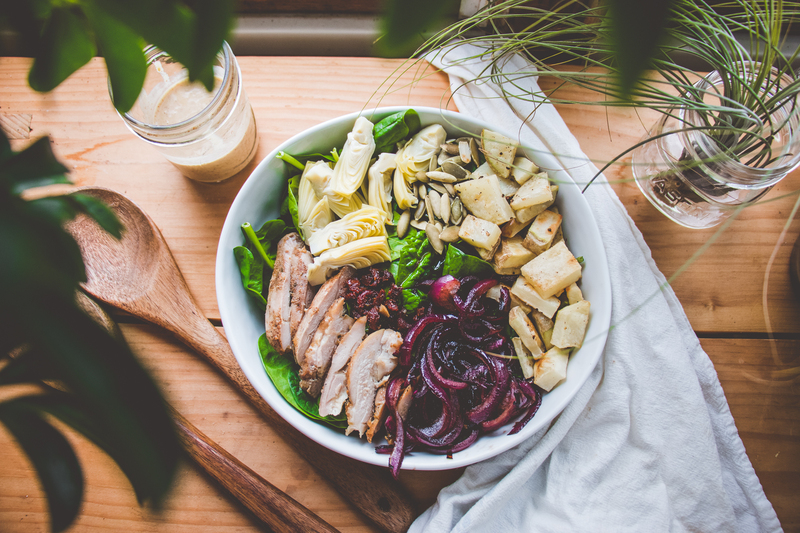 Leftovers will keep refrigerated in airtight container for up to 3 days—though best served fresh.